Let yourself be carried away into the Middle Ages, let the rolls roll, and become a victorious knight. There are, of course, no medieval conditions, but you can sit relaxed at home and experience your knight adventure with - Knights Life Slot! Here, with this game provider by Merkur Gaming - Knight's Life, the player plunges into a world full of legends, heroism, and wealth. Merkur Gaming is a part of the German Gauselmann Group – the largest gaming company in Germany with 8000 employees. They have more than 50 years of experience within the gaming industry and live by the cornerstones – Tradition – Passion – Innovation. They have made a name for themselves through land-based gaming products such as slot designed cabinets, games and progressive Jackpot systems that are integrated worldwide. The company was founded in 1957 by Paul Gauselmann. The company has branch offices across the globe, but the head office is still in Germany, in the city of Lubeck. Merkur Gaming has a sun as its logo. It is world known to symbolize experience, innovation, quality and entertainment. Their games are designed to suit all types of players, and they are packed with the latest technology, modern graphics and rewarding features. This is to ensure that you, as a player, get the best gaming experience. Merkur Gaming always offer games that are extremely good, with full HD graphics, cool concept, bonuses, free spins and a wide variety of features, a few of them being 221B Baker Street, Cash Fruits Plus, Double Triple Chance and Blazing Star. 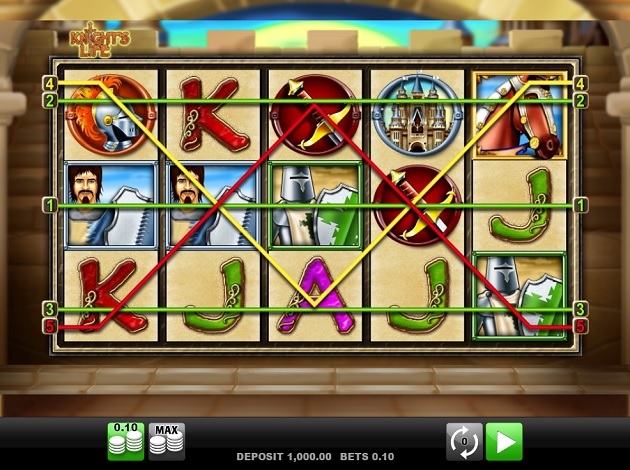 Knight's Life is a beautiful 5-reel, 3-row, with 5- fixed paylines, multiplayer game machine designed by Merkur Gaming. The Slot revolves around the battles of the brave knights and the symbols include wizard, a golden armour, red shields, silver helmets, locks, swords, horses, knights and colourful card symbols - and looks like they have been teleported straight out of King Arthur’s court with due permission of Sir Lancelot. The game consists of 13 different symbols. These symbols must be placed in the correct combination on one of the 5 paylines. In order to make a profit, at least 2 or 3 identical symbols must be placed on one of the winning lines. With the card symbols Ace, King, Queen and Jack, you will get the first small but fine winnings. Especially if Merlin has his fingers in the game, your premiums may be higher. Otherwise, you will get back your bet on three identical symbols. Five of a kind will quintuple your investment, while a fully-filled payline will give you 2.5x your stake. Without armour, the knight never leaves his castle. These objects must therefore not be missing in a Knight's Life. However, since they are among the lowest-profit symbols, you need at least three of a kind, as they triple your bet. Four identical images are 2,5x while five identical symbols can reward you up to 50 times. Your journey as a knight is enhanced by many lucrative bonus features, while there are wild symbols, scatter symbols, multiples and multiplicators. We will explain to you all the facts of all the symbols. This video game will reveal a magical world and will show you the way to the big winnings. Knight's Life convinces with a good payout behavior, precise graphics and appealing sound effects. With Knight's Life, Merkur has succeeded in creating a visually appealing game machine, which is convincing thanks to its clear design and clear structures. The positive impression is complemented by a wealth of interesting features, which allow you to make big profits at a manageable risk. You can already experience the adventure with a small bet together with the brave knights. – with this incredible slot played on 5 reels, and 5 fixed paylines and the lowest bet with the 5 fixed paylines begins at € 0.15 and the maximum bet is € 10. The highest payout is for the wizard, who, if he appears five times in a line, pours the highest possible profit depending on the stake. In addition, it also functions as a wild symbol by replacing other symbols for a winning combination except for the bonus symbol. The famous wizard works as a Wild Symbol and can, of course, replace any other winning symbol in the game. He also doubles the profit. Scatter is the horse that can bring you up to 30 free spins. As of the sixth example, each gain is doubled and multiplied three times from the eleventh example. In the case of winning, you will have the risk features that are typical for each Mercury Slot: risk card game. At the risk card game, you must guess the next card colour and your profit is doubled, and you must click at the right moment to climb the ladder and win more money. Keep in mind, however, that with this feature you can double your profit as well as completely lose it. The wild symbol in the game is the magician. - Merlin is the wild symbol and it replaces all other symbols for winning combinations, except for the Scatter Symbol and gains obtained with it are also multiplied by x2. 2x Wizard The bet is paid twice as a win. 3x Wizard: The bet is paid 50 times as a win. 4x Wizard: The bet is paid 500 times as a win. 5x Wizard: The bet is paid 1000 times as a win. Additional function: The wizard replaces all other symbols (except the scatter) and doubles the gain. The second special feature is the scatter symbol: the horse. This is not a symbol, because it always gives you a profit if it just shows at least twice, regardless of what roll and profit line. If the horse shows you even three times, you can look forward to ten free games. When you land on 3, 4 or 5 scatter symbols you get corresponding to 10, 15 or 30 free spins. In these, the knights are transformed into additional wild symbols and gains in multiples can be multiplied up to x3. And indeed very special Free Games here not only is every win doubled, but here the knights are also themselves a wild symbol. So you can clear more and you can even put the overall profit at risk, if you dare. Do you feel like a bit of adventure? You like fantasy and knights? Fights and wizards are for you? Then you are right at Knights Life.